Shaman Elizabeth Herrera practices shamanic journeying (Native American spirituality) to request healing for people’s minds, bodies and spirits, allowing health, peace and happiness to more fully enter their lives. During a shamanic healing, Shaman Elizabeth works with the wisdom of your divine self, spirit guides, ancestors and the angels to uncover the core issues affecting your life and ask for healing. Elizabeth has found the practice of shamanism to be life changing. The connection to the divine power has opened her mind to the wonders of the unseen world, which affects every aspect of our lives and even the entire universe. 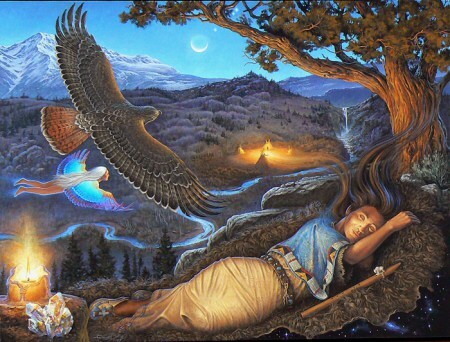 Through shamanic journeying, she has learned that we are all connected — the earth, sky, nature, animals, winged and sea creatures, and mankind — singing one song of unending love. In-person shamanic healing appointments take place at The Sagewood Center, 6801 Pleasant Pines Drive, Raleigh, NC 27613. Remote shamanic healing is equally effective as an in-person session because all healing takes place in the spirit realm. During your appointment time, you can lay quietly or go about your business. After the healing, Elizabeth will send you a detailed email describing the healing. For more insights into shamanic healing, read Elizabeth’s book Shaman Stone Soup.